Thursday March 27th 1879 I did a big ironing in the forenoon and Hatt finished the cleaning upstairs all but the hall. After dinner I cleaned both stairs and halls. there were a number of callers here this afternoon among them Mrs. Custor to invite us girls over there tomorrow. I was tired and went to bed early. pleasant day. Win no better Friday March 28th 1879 I did some washing this fornoon a lot of old things for carpet rags. Hatt and I went over to Custors in the afternoon and had a very pleasant visit I cut rags in the evening. The men folks all went over to the Railroad meeting where Father was to speak. 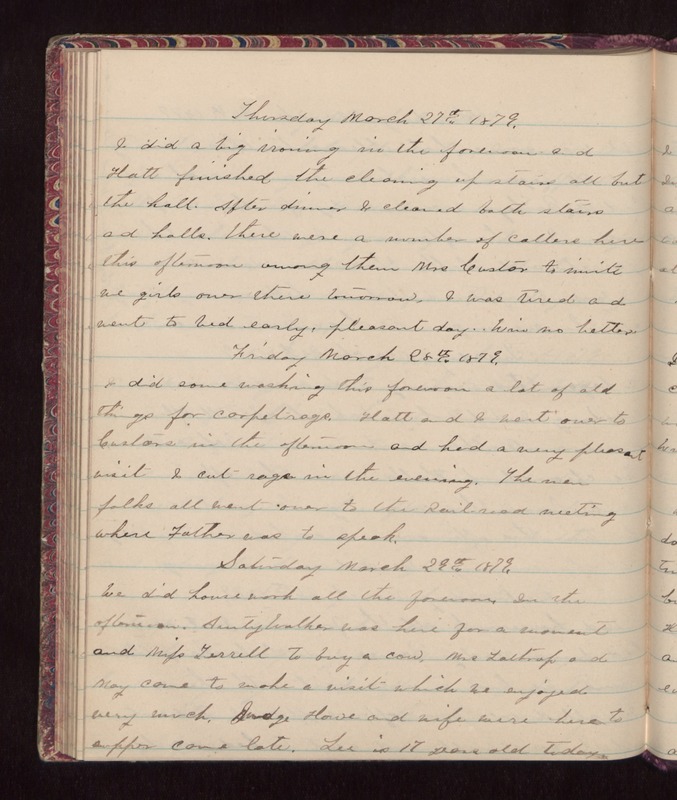 Saturday March 29th 1879 We did housework all the forenoon. In the afternoon, Aunty Walker was here for a moment and Miss Terrill to buy a cow. Mrs. Lathrop and May came to make a visit which we enjoyed very much. Judge Howe and wife were here to supper came late. Lee is seventeen years old today.